There's still a lot of concern over the state of the economy and many people are still being careful how they spend their disposable income. One area of spending that has taken a hit is traveling. The good news? New Mexico is full of inexpensive, local attractions. I'm all about looking around and seeing what is available in your local area. 2. Picnic in the Sandias- Who doesn't love taking a short drive up into the mountains towards Sandia Peak? On your way, pull over and dip your feet in the streams, collect leaves and pinecones, and have a picnic lunch. 3. Old Town- The original epicenter of Albuquerque, Old Town once served as a military outpost. See historic buildings and the almost 300 year old San Felipe de Neri church. Window shopping here is great. More information on Albuquerque Attractions can be found here. 1. The Farmer's Market- Held at the train depot on Saturdays from 8am-1pm, it's free and you never know what deals you'll find on local produce, handcrafts, and prepared food. Lots of food vendors will offer a sample, especially if you ask, making it a great way to try before you buy. Cooking demonstrations, live music, and local artists make it a full day of fun. 2. Museum Hill- 4 museums in close proximity and the "M" bus will take you between the museums and the plaza (http://www.santafenm.gov/index.aspx?NID=1233) without breaking your budget. All the museums are FREE to New Mexico residents on Sundays. 3. Palace of the Governors- This museum is in the plaza and was the original seat for the Spanish government to rule New Mexico. 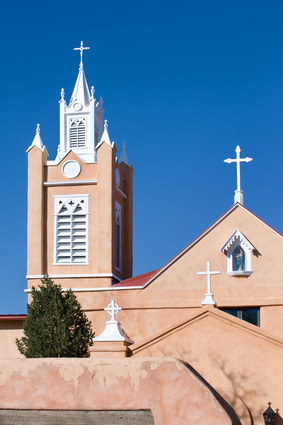 See the history of the area and see it for FREE on Sundays as a New Mexico resident. Here's why these are some of my favorite Santa Fe travel ideas. Of course, there are tons more inexpensive attractions that come and go for limited times. The best way to keep track of these is to find a local publication or check your city's website for upcoming events. There is no reason to stay on your couch when your options for getting out are as great as these. Have a wonderful time exploring your local area and making family memories! I'm Lynn and if you'd like to see more of why I love New Mexico, come visit me at www.newmexicoenchantment.com. I absolutely LOVE this post! Seriously, I can't tell you how much, these are great ideas. This is how the conversation always goes in our house: "what do you want to do this weekend?" "I don't know, something fun." "Well we don't have much money, what can we do that's not expensive?" "Ummmm I have no idea." So we end up staying home and watching tv. This is going to make a great weekend for us! Is the Farmer's Market in Santa Fe open now? Is it bigger than the Corrales Farmer's Market? Great ideas!